Join us each week for worship and opportunities to spend time together! Thank you so much for your care and prayers sent to us through sympathy cards and memorials. It truly brought us comfort and consolation. Please continue to keep us in your prayers as we mourn. 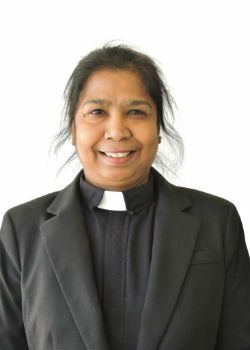 Pastor Nirmala’s father passed away August 13. She spent three weeks in India with her family, but she is back in the office now. Labor Day weekend again marked the end of summer and the beginning of a new school year at St. John’s! This year I am working on different ways to strengthen my own prayer life. In the coming weeks, I plan to start a daily prayer practice. It will be open to others who are looking for a place to listen to God and the world around us. If we truly believe prayer is meant to be a conversation with God we must take time to center ourselves on Godís Word and just listen. As you finish your summer out, I pray that youíll take a little time to be still. Our Southeastern Minnesota Synod’s bishop, Steven Delzer, will join us on Wednesday, October 11. He will preach in worship and lead us in a town-hall-style meeting afterward. We will hear more about how the synod will help guide us on this process of defining our congregation and seeking out our future leaders. It is a great time to ask questions about the coming months. Have you ever wondered what the commissions of St. John’s do? Who is on the congregational council? What sorts of things the youth group does and when? What is Food for Friends? If you have ever had these questions or others, or perhaps wondered how you can be more involved in serving God’s kingdom through St. John’s, make plans to visit our ministry fair Sunday, September 17, 9:00-10:00 am and Wednesday, September 20, 5:30-8:00 pm. No pressure to join anything, just come and learn and join in some time together! The 4-year-old & 3rd grade Bible Blessing will be on Sunday, September 24 and Wednesday September 27 at all worship services. Thank you to those who help support the purchase of these Bibles through their donations! 4-year-olds will receive a Spark Story Bible and the third graders will receive a study Bible from the St. John’s Lutheran Church faith community. Third graders will also participate in a Bible Adventure course to learn about their study Bible and how to use it. The next Ministry of Encouragement (MOE) will be to The Center Clinic in Dodge Center on September 20 to thank the paid and volunteer staff for the great work they do in Dodge County. For many years they have provided services to the uninsured, underinsured, and low income. Learn more at www.thecenterclinic.org. Our purpose is simple — to acknowledge and encourage the staff in what they do by bringing food and beverages to indicate their efforts are appreciated. We’d love to have you come along with us but if you can’t, you can still participate by contributing food. We will meet at St. John’s at 8:30 am and carpool. Details and signup at the Welcome Center and www.stjohnskasson.org/moe. Mary Adam and Ardis Grovdahl co-lead this ministry. If you have questions, contact Ardis at grovdahlardis@kmtel.com or (507) 634-7644. St. John’s has openings in both our music and preschool ministries. If you are interested in more information or applying for the following positions, visit www.stjohnskasson.org/now-hiring or contact the office. We have featured hurricane relief by Lutheran Disaster Response in our recent Globe Offerings. Gifts given to this ministry are used 100% for disaster response. If you still wish to give, give a check marked “Lutheran Disaster Response” to St. John”s or visit www.elca.org/disaster. Please join Adult Fellowship as we journey to Dodge Center’s St. John Baptiste de la Salle Catholic Church on Sunday September 24 for their annual turkey dinner. We will meet in the church parking lot right after the 2nd service & proceed from there. You may call Barb Pike 634-7179 or Carole Baker (507) 634-7133 to let us know that you plan to attend, or just show up in the parking lot around 11:15 am. Make plans now to help with the 56th annual Lutefisk Dinner to be held on Thursday, October 26, 2017. Lefse bakes began on August 23 and will continue Wednesdays through October 18. In addition to lefse bakes, you can volunteer in many different capacities. Renee Solberg will continue as dinner chairperson; Shelley Gustafson and Marge Albright will again serve as co-lefse leaders. 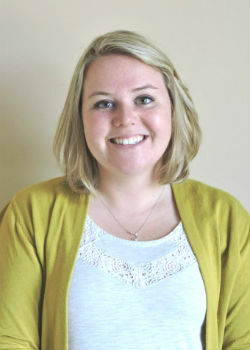 If you have been looking to become more involved, the lutefisk committee welcomes new members. Our current members have all served many years and for this dinner to continue, new leaders need to join the committee. Please think about saying “YES”! The lutefisk committee is pleased to report that most proceeds from the 2016 dinner and bake sale have been dispersed. Many organizations and groups have benefited from our proceeds. THANK YOU! We are looking for some great people to help us out! Due to some members of our money counting team deciding to share their talents in new ways with the congregation, we are looking to find some new volunteers to help us with this weekly project. Ideally, we are looking for three teams of two to help us count and deposit the weekly offerings into the bank. The current counters worked Monday mornings, but we can work with the new team to determine if this time works best or if we need to move it to Thursday morning or Monday afternoon as a couple of options – we can be flexible. This position works great if you have a good friend to help you out as teams of two help us ensure we have dual controls and ensure we are accurate in our counting each week. If just you yourself are interested, that also works just fine. We are hoping to establish some rotation within this group to ensure we always have tenured people on board and people do not feel like it is a commitment for life. You can sign on for a term of 1-3 years and then decide if it is something you wish to continue or not at the end of your term. This allows us to better plan for turnover when you wish to share your talents in other ways with our congregation. If interested, please reach out to treasurer Adam Richards (aerichards1977@gmail.com or (507) 251-0677) or a member of the congregational council. Guess what time it is? IT IS SHOE BOX TIME! 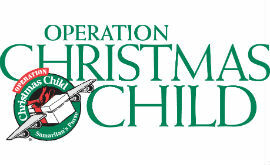 That’s right, Operation Christmas Child! Packing parties will start Wednesday, September 27 around 7 pm (after worship). They are scheduled every Wednesday and Sunday until November 11, with a few days off. If you or your group would be interested in doing a packing party, please Tanya Young know. We are open to doing them other days as well. The 2nd annual parade will be held October 8 at 3:30 pm. We will collect supplies in the streets of Kasson with fire trucks, ambulances, police cars, and St. John’s Blue Bus. Additional features will be in the parade, but you will have to wait to see what they are. Following the parade, we will meet back at the church for refreshments. Please consider walking or riding in the parade with us. Thank you so much for your continued support of this project! For more information, contact Tanya Young at (316) 390-5368 tyoung8550@yahool.com. A PERSONAL NOTE: You may enclose a note to the child and a photo of yourself or your family. If you include your name and address, the child may be able to write back. DO NOT INCLUDE: Used or damaged items; war-related items such as toy guns, knives or military figures; chocolate or food; out-of-date candy; liquids or lotions; medications or vitamins; breakable items such as snow globes or glass containers; aerosol cans.